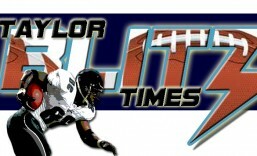 Our annual of what we expect from teams in the upcoming 2011 football season. 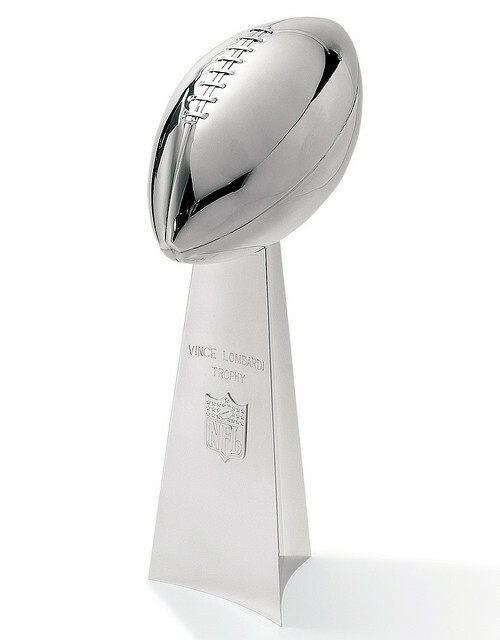 Preseason Predictions and Super Bowl Predictions. 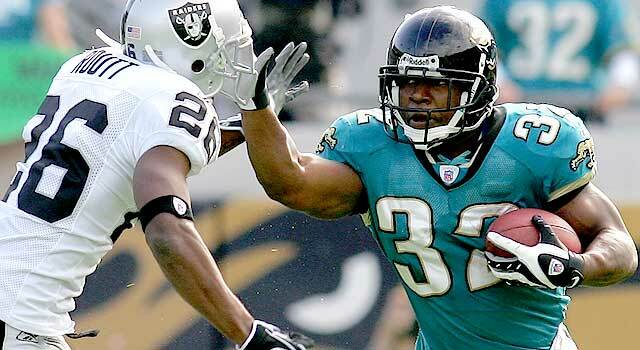 Titans @ Jacksonville: Titans Two rebuilding teams yet the Jaguars aren’t over the release of David Garrard. Lions @ Buccaneers: These are two up and coming teams…have to take the Bucs at home. Panthers @ Cardinals: Panthers should run the ball successful enough. Vikings @ Chargers: The Chargers win this one. Giants @ Redskins: Giants ground game and defensive pass rush will dominate this one. Cowboys @ Jets: Jets get off on a winning track to get themselves headed for first Super Bowl since Namath. TOTAL RECORD= 0-0 We’re undefeated baby!! The AFC East had been the sole province of the New England Patriots and Bill Belechick. They were 14-2 last year and Tom Brady had the best statistical season of his Hall of Fame career. They had pummeled the Jets 45-3 when the two battled for first place late in the year. Then a strange thing happened, the Jets grew up. The team who’s coach had brazenly scoffed “I wasn’t brought in to kiss Belichick’s rings” had returned to Foxboro and beat the Patriots in the playoffs. In doing so, not only had they stopped what many thought to be another Super Bowl run for the Patriots, they may have knocked the AFC East off it’s axis. After two seasons of being the little dog nipping at the heels of other AFC heavyweights, they have now become the big dog. The New England Patriots have countered by taking some significant roster risks in signing WR Chad Ochocinco, DT Albert Haynesworth, and elevated S Patrick Chung to starter and releasing S Brandon Merriweather. They return Tom Brady who threw for 36 TDs and only 4 interceptions and one of the best offensive lines in all of pro football. 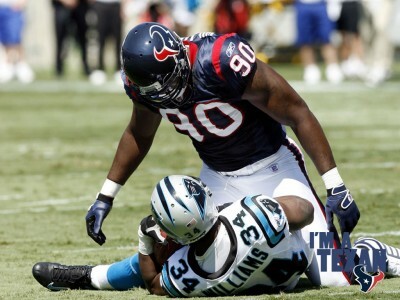 Also returning is All Pro linebacker Jerrod Mayo who led the league with 175 tackles and improving LB Brandon Spikes. 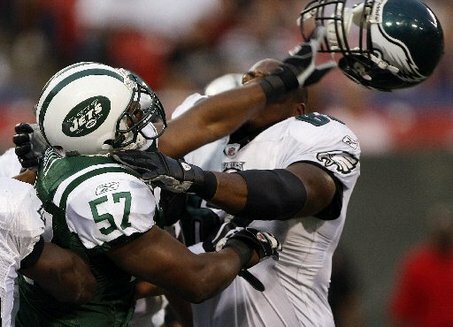 He did sign former Jet DE Shaun Ellis to provide depth for his defensive line. Can their young defensive secondary grow up fast enough for King Belichick to stave off the barbarian Jets at the AFC East gates?? 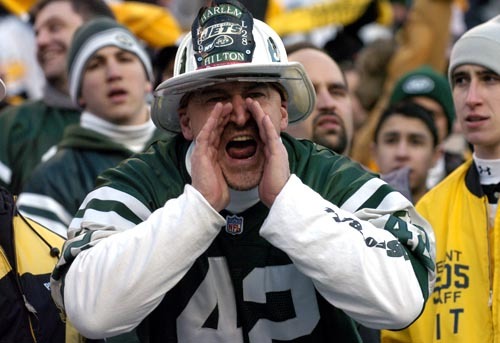 Meadowlands Chant: J-E-T-S JETS!!! JETS!!! JETS!!! Not this time. Belichick had so many draft picks it was frightening, yet came away with a moderate draft at best. He likes his players but can Ben Jarvus Green Ellis and Danny Woodhead at running back make a Super Bowl run?? With Wes Welker and Deion Branch as the starters at WR over Ochocinco they won’t get open against Jet corners just like last year’s playoff game. Resurrected Shawne Merriman looks to wreak havoc in 2011. 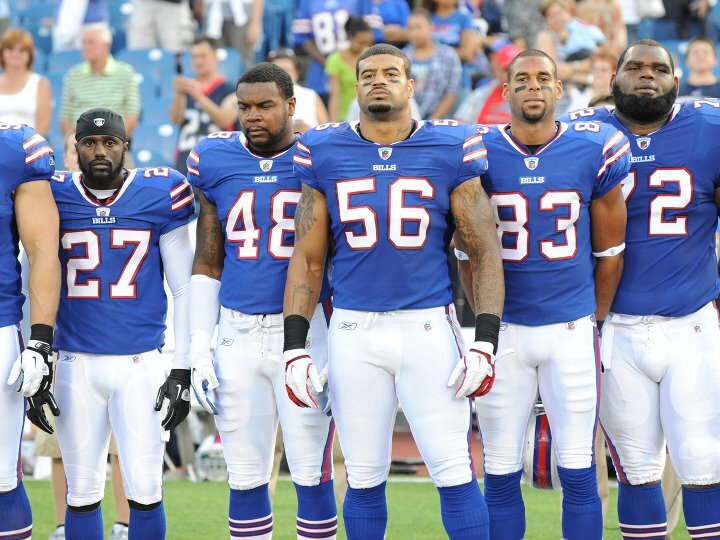 The Buffalo Bills have made some defensive improvements with 1st round draft pick Marcel Darreus and the resurrection of former Charger Shawne Merriman. The 3-4 provided a 9 sack performance in the third pre-season game against Chicago Bears and bodes well for the new season. Although the team lost LB Paul Pusloszny to Jacksonville through free agency. WR Stevie Johnson has to improve and make fans forget about the departed Lee Evans. Ryan Fitzpatrick has been a solid quarterback yet doesn’t seem like there is more upside to him. He’s serviceable at best and the team needs to find a way to get C.J. Spiller to mimick his explosive collegiate play in Buffalo. They still need an everydown back and again Fred Jackson is serviceable without much more upside. The Bills will be in more games yet don’t have the playmakers to win the majority of them. The Dolphins are going to try and ride the playmaking ability of Reggie Bush to produce bigger plays on 3rd down. So far so good in the preseason. With Brandon Marshall and Davone Bess alongside, they have playmakers and need Chad Henne to grow into his position as the starter. He should be motivated with the flubbing of the Kyle Orton trade and knows this is his last chance. Where the Dolphins sneak in several wins is with an opportunistic defense. OLB Cameron Wake is a stud who had 14 sacks last year and along with ILB Karlos Dansby, CB Vontae Davis, and Yeremiah Bell are playmakers on defense and will win a few more of the tight games that Buffalo would lose. They are not yet ready to take on the Patriots or the Jets for division supremacy, yet could make some strides this year. As we stated to you in February: I can’t say it enough but Mark Sanchez is on the cusp of super stardom. He’s young, mobile and grew a thick skin during the ’10 playoff run. This is the only quarterback in the NFL to defeat both Peyton Manning and Tom Brady in a single season playoff run. Understand what you are seeing here and yes the Jets are a run first / pass second team. Its a more traditional take on how to run offense yet no other quarterback in history was asked to defeat 3 consecutive Super Bowl winning quarterbacks in one post season run. Yet he didn’t crack under the pressure and proved to be a leader on the rise until the bitter end. 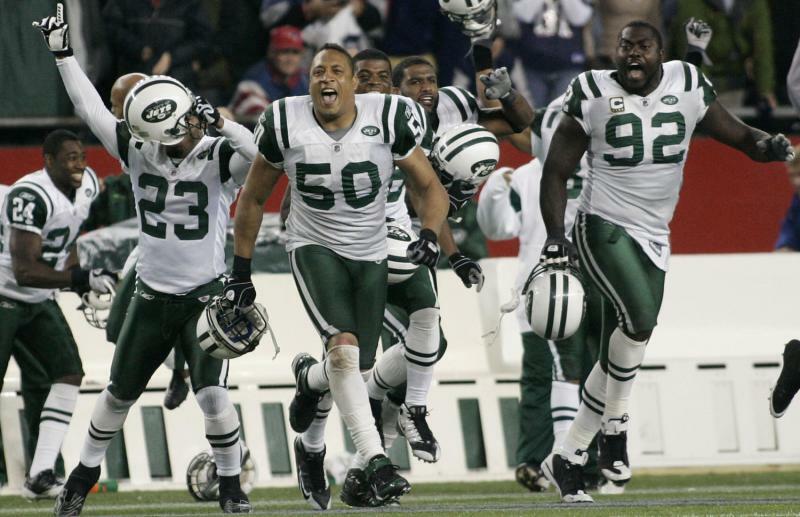 After throwing for 5 TDs and only 1 interception in last year’s playoffs, Sanchez was seen rallying the troops on the sideline (most notably) with Jerricho Crotchery that the cameras picked up in the waning moments of the AFC Championship. Mark Sanchez has been excellent in the preseason, he’s been ready from day one of camp. Another look and you see that Plaxico Burress is playing with a chip on his shoulder in place of departed Braylon Edwards. That additional veteran spark and moxie should bode well for an emotional, motivated team. What awaits this team is a chance to play with homefield advantage and have the road to the Super Bowl go through the Meadowlands. The winds of change will blow across the AFC North this year starting at the midway point. The Pittsburgh Steelers are due to succumb to age and fatigue. Much like the Los Angeles Lakers in basketball, they’re forays into the NFL playoffs have equalled nearly a complete additional season of wear. Since 2004 the Steelers have participated in 13 post season games. Coming back with 7 projected defensive starters over 30, this should become an issue as it has shown with Troy Palamlu’s late season injuries. With a physical team, it doesn’t bode well for back to back seasons. 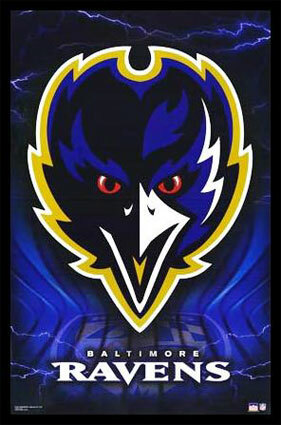 Even when this team won the Super Bowl after the ’05 and ’08 seasons, they missed the playoffs the following year. The Cincinnati Bengals have been on a strange odyssey over the last half decade. 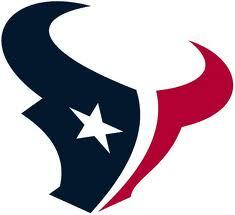 They have made the playoffs twice in the last 6 years, yet we had witnessed promise that should move them to the next level, and we’ve been disappointed. At time of this article, Carson Palmer is still in a self imposed exile, and Terrell Owens and Chad Ochocinco never became the receiving threat as promised. All three are gone from the 2011 squad that is searching for an identity and leadership under coach Marvin Lewis. They signed scrappy quarterback Bruce Gradkowski, who looked really good against the Colts in the 3rd preseason game. Will he be able to channel that moxie into firing up his teammates?? Will they have the players to take advantage of it this year?? There is work to do in the Queen City. Applause for the Cleveland Browns. They are returning to the 4-3 defense after a forgettable stretch in a 3-4. They just don’t have the athletes to run that type of defense and this is a step in the right direction. 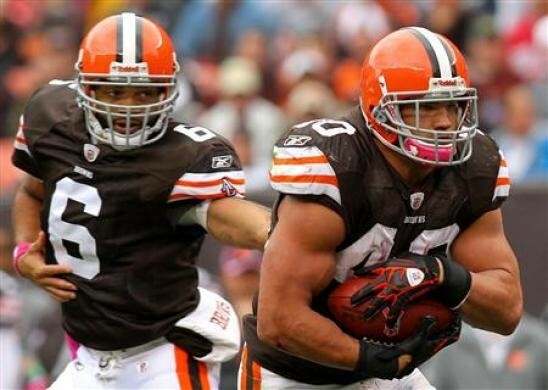 Peyton Hillis should get the ball as a featured back this year and could wind up with a 350 carry season. With the team slowly bringing Colt McCoy along at quarterback, they’re going to have to win some close to the vest affairs. Especially when they face the Steelers and Ravens. All four of these game happen between weeks 13 -17. So they have time to build some confidence and get ready for these cold weather games. Right now, new coach Pat Shurmur is out to find out who is ready to take the next step and lead the Browns back to prominence. Shouldn’t be a factor until next year at the earliest. Back to Pittsburgh. The Steelers have developed some young talent at receiver and running back and could have one of the their best offenses in many years. Antonio Brown looks like a legitimate deep threat and kick returner. 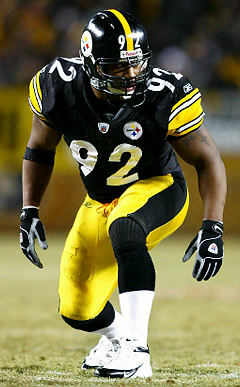 He gives the Steelers an explosive element not seen since the heyday of Antwan Randle El. Roethlisberger is still in his prime and will have to bail out the Steelers late in many games this year. The one player who should be at his best should be James Harrison, he shows no signs of slowing down and is the enforcer on that defense. He is the one player Pittsburgh can’t afford to lose on defense. Do you realize he is coming up on the all time record for most fumbles forced for a career even though he’s been a starter for only 6 seasons. He’s a wrecking machine and a former defensive player of the year. For the Steelers to retain their AFC North mantle, it’s he and Woodley who have to make all the plays. The problem is they can only mask a deficient secondary so long. See Super Bowl XLV game footage…yet we digress. The Steelers, just like the Ravens will ultimately be undone by their secondaries. However when it comes to the AFC North, the Ravens win it….barely. Thanks for reading…share the article.